Don’t you wish in life, and in bathroom remodeling, choices were simpler? While the Internet has delivered us a world of information, this hasn’t made selecting bath remodeling products simpler. In fact, it’s made selections harder. Recently I could feel this painful decision-making process oozing into my headset while talking to Pam about her bath remodel. She was looking for input on whether to use matte or gloss finishes for her shower pan, shower wall panels, flooring and fixtures. Having to choose between gloss and matte finishes made the product selection task even more complex. As Yogi Berra would have advised Pam, “When you come to a fork in the road, take it.” Pam’s ‘fork in the road’ was determining the right choice between gloss and matte finishes. To step back, you can think of a gloss finish as a shiny reflective surface. A matte finish can be defined as flat or non-reflective surface. Like a ‘good politician’ (does one of those exist? Sorry for digressing), I told her ‘it depends.’ Depends on what, you may ask? 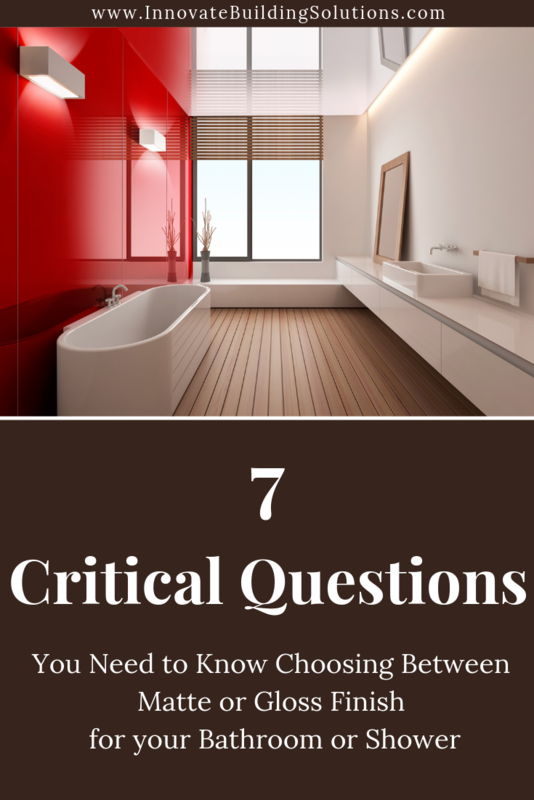 It depends on the answers to 7 critical questions. Let’s check out the 7 questions.